Today marks exactly ONE YEAR since I started my job at Blakely. Wow… time flies when you’re having fun! And it has been fun! 365 days of getting out of my comfort zone, learning, being challenged, feeling intellectually stimulated, meeting new people, feeling inspired by new causes, travelling (40/365 days), laughing, stressing, and getting a whole lot of &*#! done! If you’ve been reading my blog a while, you can probably guess how I’d like to celebrate this occasion. Gone are the days of leaving a meeting with an action item and getting to it eventually. The pace of work at Blakely means 9 times out of 10, when you have something to do, you have to do it NOW. It’s a great lesson in prioritizing, because when there’s 9 things to do NOW, which one do you start with? I still don’t know if I’m always making the right choices, but I’m learning and getting better. What else could you want from a job? Unfortunately for me (and the donors! ), I’ve never worked somewhere where the creative aspect of fundraising is a big focus. Maybe the creative writing, but not the art. That is one of the most fun parts of Blakely: the creative. Part of my job when executing on a campaign for a client is to brief the creative team. I might tell them what we need out of an outer envelope, which packages have done really well in the past and my thoughts on why… and then the magic happens. The artists go off and a little while later come back and the strategy has come to life! It is so cool to see, and I find the process – and especially the output – so inspiring! The truth is, the thing we want donors to do is actually open the envelope. It takes good creative to do that. Another thing I’d never really been focused on before was the second gift. That is a HUGE part of our strategy at Blakely. Inspiring a donor to give is a start, but inspiring them to give again? That’s where the work really begins. You have to thank them – fast and furious. You have to give them a good sense of their impact right away. And when you do ask, it’s gotta be for the right thing in the right way at the right time. It’s an art, and I love learning about it. With the reactive nature of my job, it’s hard to find time to do anything, but it’s really hard to find time to think. I mean really think. I can get a slide deck together to present a campaign plan to a client, no problem! But how much thought has gone into it? How many colleagues have I spoken to in advance, to run ideas past them and ask them questions? How much time have I spent reviewing past campaigns? Looking at results? Figuring out what works, what doesn’t, what we might test this time? It’s critical to make time for this important thinking work. When done right, a campaign is stronger than ever! I’ve always enjoyed data and analysis, but it’s not my strength, so that’s been a big learning curve for me. Let’s say I’m populating a slide deck with some results… I can make some commentary on what happened, but my real role is to say why it happened. That’s not so easy. But I’ve learned to stop myself more often and ask why? Is it because the mailing went late this year? Was the creative too subtle for the donors? Was there not enough time between the last mailing and this one? It’s about really getting under the results, and it’s fascinating! It feels really good to be valued, and I feel valued at Blakely. The work I do with this blog is valued. It means I’m part of the online fundraising conversation; sharing ideas, connecting with guest bloggers, and constantly learning. My activity on Twitter is valued, really for the same reasons. I’m connecting with fundraisers worldwide; learning from them, and sharing my own thoughts. The networking I do is valued. I meet people and create relationships in this wonderful weird world of fundraisers. And my voice is valued. I am brought to the table to talk about things in my scope of work and far outside of it, just to offer my opinion. Sure, there’s lots of business benefits to all this, but it’s also about the value the company – and the people in it – place on learning, knowledge-sharing, collaborating, and more. Needless to say, I’m a very happy fundraiser right now! Maeve’s Top 5 & Happy 4-Year Anniversary, What Gives! I am so proud to be going into my fifth year writing and editing this blog. For me, it’s been four years of learning, growing, tweaking, improving, reflecting, and feeling inspired. I hope you have felt inspired, too! To celebrate, I wanted to list my Top 5 Posts. They are in no particular order, and I used no criteria to choose them. Most of them have been more popular among readers, but what they have in common is that I’m proud to have written – or posted – them. Enjoy! And thanks for making these 4 years so great! Although #whatgiveswednesdays was a short-lived series of posts about young constituents and how we can engage them and inspire them to give, it still had a lot of gems including this post. In fact, the whole point of this post was to summarize some of the learnings from the series. Check it out for a quick, concise read! You know why I love this post so much? Because John Lepp liked it! When someone I respect likes what I write, it makes me feel especially good about it. It may sound silly, but it’s not. I enjoy the process of writing this blog every week, but of course I write it because I hope it’s valuable to my fellow fundraisers. So I feel proud about this post because it resonated with John Lepp. It’s all about the difference between customizing (i.e. 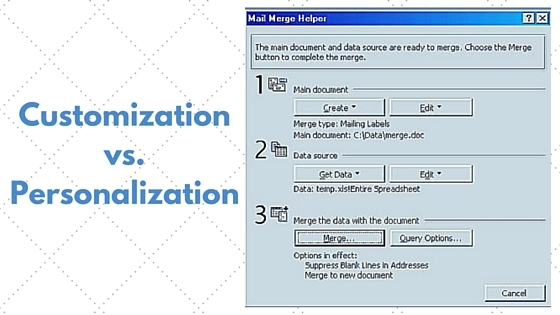 mail merge) and personalizing (i.e. taking the time to handwrite a thank you note to a donor). Key distinction, and a post I look back on with pride. One of my most important discoveries as an introvert and a fundraiser is that those things are not mutually exclusive. When I first got into the field, I thought I had a disadvantage as an introvert, but I realized that wasn’t true. 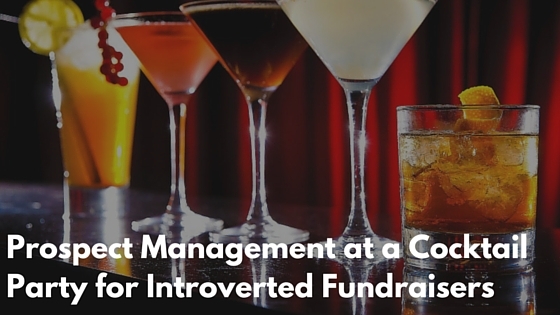 Being an introverted fundraiser is a great advantage… but you sometimes need survival tips when it comes to cocktail parties. Check out this post for some of my main tips, for example take breaks. I had to include a Rory Green post in here because she’s written more guest posts for this blog than anyone, and the majority of the most popular posts of all time on this blog are Rory’s. I love this post because I love fundraising, I love Beyoncé, and I love Rory Green. She makes content so fun with gifs and snappy, effective messages. If you haven’t read this one already, do! And lastly, this post. Beyond my love of working with the great concept of #donorlove, I felt it was really important to talk about leaving a job and how to do it gracefully, and in a way that shows love to your donors, instead of abandonment… which too often happens. The way we leave an organization should be a reflection of how we spent our time there… especially from the donors point of view. I’m very proud of this post. So there you have it! Thanks for an awesome four years, readers! Onto the next one! Maeve is the Founder of What Gives Philanthropy and has been working in fundraising for over eight years. Click here to learn more about Maeve. Ideally I would save this blog post for next week, but my sanity relies on routine, so I’ll stick with my regularly scheduled “every other Friday at 10:00 a.m.”. What’s today’s post about? 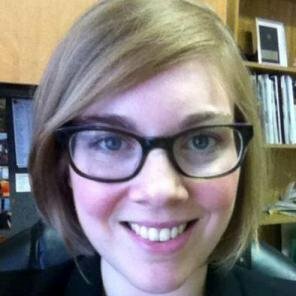 Well, right at this very moment I am in a session called “Picasso & Edison: Learn how to be both an artist and scientist in today’s fundraising world”, led by Samantha Laprade, CFRE (a.k.a. @GryphonReport). No, I am not blogging in front of her rather than paying attention to her session! I am writing this post from the comfort of my hotel room in Toronto on Thursday at 5:00 pm. I have just attended Day 1 of the 2014 Canadian Higher Education Annual Giving Congress in Toronto a.k.a. 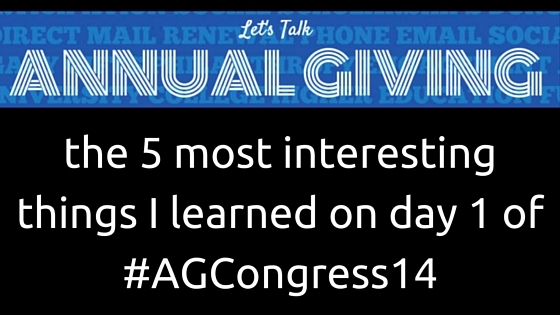 #AGCongress14. Yes, it’s me and dozens of other Annual Giving nerds talking about what we do and how we can be excellent at it. I’m in heaven! STOP! Be stupidly creative. The very inspiring Joel Faflak of Western University started the day off by telling us to stop doing what you’re doing and do something mindlessly creative. Draw, see a musical, do something! Our creativity is being threatened by the business of our every day work, but we can’t stop cultivating it. Don’t solicit young alumni with the traditional academic segmentation. My friend Ryan Brejak of the University of Guelph (and a guest blogger for this site) delivered a great session on young alumni giving and stressed that millennials need to be segmented differently rather than by their faculty. Segment them by the non-academic affinities they have. Why would they care? I attended a panel about “How to Write for Development” and asked them what’s more important in a fundraising letter, to emphasize need or success. Chuck Chan of University of Toronto replied that it’s most important to focus on why the reader would care about this. Would they care about a dilapidated building, or would they care about what’s going to happen in a new one? There are three types of donors. I attended my mentor Paul Nazareth‘s session about planned giving and he outlined three types of donors: (1) the DNA donor, where giving is in their DNA, and so is your organization; (2) the academic, who values your institution because of how they turned what they learned into success; (3) and the trouble makers and weirdos who had a great time at your institution who will give back because of their experiences. Everyone should be an annual fund prospect all the time. The last session of the day was led by two fundraising powerhouses: Lorna Somers & Bob Burdenski. They talked about the worlds of major giving and annual giving colliding, and Lorna stressed that major gift prospects/donors should never be taken out of annual solicitations. They should always receive the calls, direct mailings, etc. and major gifts should “opt out” of this if really necessary, whereas the default will be that they’re solicited annually. What a great day Day 1 was. I bet I’m already energized by Day 2 and it’s only 10:00 a.m.
Maeve is the Founder of What Gives Philanthropy and has been working in educational fundraising for the past seven years. Click here to learn more about Maeve. I know I’ve spoken about being an introvert before. This is not a weakness of mine nor is it an area for improvement, but in a world dominated by extroversion, you do have to make a concerted effort as an introvert to determine your approach. 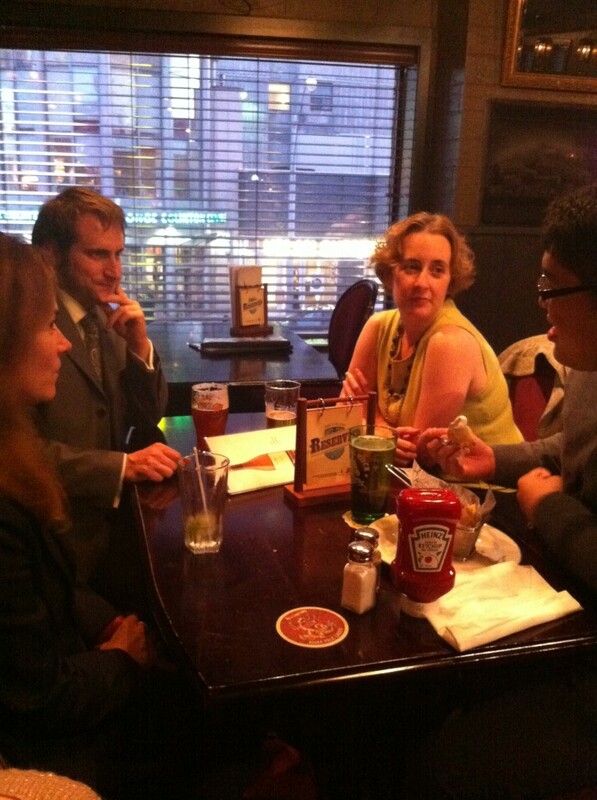 Case in point: prospect management in a cocktail party setting. In my role at Laurier, I am a prospect manager. I now have my own portfolio of prospects to cultivate, solicit, and steward. This occasionally involves a cocktail party-format donor appreciation event, one of which took place this past Tuesday. Now, I wouldn’t say these kinds of events aren’t natural for me, nor would I say I find them difficult… I’d just say I find them draining. I might even say I find them very draining. So for a person who’s trying to strategically use their energy in that kind of event, what should the approach be??? Make a plan: One thing that helps me in these situations is making a plan in advance. I figure out how many prospects I have attending and write their names down on a list that I can reference throughout the event. On Tuesday I had 4 prospects who RSVP’d yes, so I wrote down their names and planned to connect with all of them. Adjust the plan: Does everyone who RSVPs to an event show up? Never. On Tuesday I hovered near the nametag table a few times to see if my 4 prospects had shown up. In the end, only 3 of them had. I adjusted my list and now planned to connect with my 3 prospects throughout the evening. Take breaks: I can mingle pretty decently, but as I’ve said, it takes a lot out of me. In order to survive the cocktail party, I need breaks. On Tuesday there was a room where the staff had put their coats and things, so 3 or so times during the event I escaped to the room to check my notes, take a breath, take a break, and then head back into the fray. Quality over quantity: With 3 prospects at the event there was nothing stopping me from meaningfully connecting with them all, but that doesn’t mean I could expect a lengthy conversation with all of them, nor did I necessarily have the stamina for it. My mantra for cocktail parties has become quality over quantity. Small talk and glad-handing takes a lot out of me, so I try to find an opportunity for a meaningful conversation with even just one person at an event of this nature. On Tuesday I was fortunate enough to have that opportunity; one of my prospects – the one I knew the least of the 3 – was sitting alone eating at a table. I approached him, asked if I could join, and we got to know one another over the course of about 30 minutes. It was fantastic; I was sitting down, in a quieter area of the venue, and got to really understand the passions and interests of an unknown prospect. These kinds of conversations do in fact energize me, and they’re what made me want to do one-on-one fundraising in the first place. With all of those strategies in place, I was able to have a personally and professionally successful evening. What are your strategies, for introverts or extroverts??? Let me give some background on why this is on my mind. I recently made what was intended to be a one-time donation to a well-known, Toronto-based charity. I read one of their ads and was so moved by it that I felt compelled to give. And then the onslaught of mail and trinkets and trash began. I’m pretty sure I made my gift within this calendar year, and I swear I’ve received 6-10 mailings from them already, with 3-4 containing gifts of some sort; gifts I’ll never use, gifts I never asked for, gifts I never wanted. These gifts are not motivating me to give. In fact, they’re irritating me, numbing me to the cause, and making me feel far less inclined to give. The gifts are getting in the way of their message, which is what inspired me to donate in the first place. When the first people started arriving, I posed my question about trinkets and trash: what do you think? Everyone said they didn’t like this approach, and from what I could tell, nobody worked for an organization that practiced it. One of the attendees, Stacey Charles (@Stacey_Charles), put it well: it’s “old school”. There is a generation of donors who like getting gifts, but I’m not part of that generation. I want to sense a need in the charities I’m supporting, and sending me gifts doesn’t express need in the same way an inspiring letter does. I want to sense that my dollars went straight to work, so I don’t want to have to worry that they’re being spent on gifts for donors. What do you think??? Is the ROI worth it? Is this a worthwhile approach? Or is it going the way of the dodo bird…? Maeve is the Founder of What Gives Philanthropy and has been working in educational fundraising for the past 6 years. Click here to learn more about Maeve. I head off today to St. John’s, Newfoundland to attend the Canadian Council for the Advancement of Education (CCAE) National Conference. In fact, more than just having the opportunity to attend, I’ve been accepted to present at the conference, and will be delivering a presentation on Monday, June 10 entitled “Alumni Mentorship Programs: Connecting, Engaging, and Tapping In”. I’m really looking forward to it! I’ve written before about Why I love what I do (here and here) and I thought of another reason: the lack of competition. I would guess that this has much more to do with the fact that I’m in educational fundraising/alumni relations and not another kind of fundraising. I know non-profit organizations don’t usually compete against one another, but they are usually competing for funding, albeit maybe indirectly. Schools, however, aren’t really competing against other schools. I mean, they are for admissions purposes, but once you get the students to attend your school, and they graduate… they’re not an alumnus of any other high school (if you’re a high school), undergraduate program (if you’re an undergraduate university), and so on. So what does that mean??? Well, to me it means that there’s no competition among educational institutions in terms of our alumni communities. I’m not writing solicitation letters to your school’s alumni, just mine. So I will gladly share my successful young alumni appeal letter with you (remember when I did that? ), because I don’t lose anything by doing so! If anything, I gain your respect, and we create an open channel for sharing. It’s a very congenial track of fundraising to work within! So I look forward to my conference, because it will be full of experiences like that! People completely open to helping you out, sharing resources, and celebrating one another’s successes! If you didn’t see it yet, my last post “A question of ethics” stirred up some amazing comments from three great fundraising professionals. Read the comments here. I have to admit that this week I didn’t have the ease of inspiration that I usually do for writing my biweekly Friday posts. Lately I’ve been so busy and have been lucky enough to have some incredible guest bloggers come in with their ideas, so when faced with coming up with one of my own… I uncharacteristically faltered. However, I was saved by the fact that every once in a while I save a draft of a blog post on something while it’s fresh on my mind and figure that I’ll post it sometime in the future. That’s why today I’m writing about an event I participated in back in November 2012 at my alma mater, Wilfrid Laurier University: Career Connections. Career Connections was a combination of a career fair and a networking event: current university students had the opportunity to visit “exhibit tables” hosted by alumni where they could learn about a specific career they were interested in, or network with alumni in diverse occupations to inspire their own career paths. Students were encouraged to ask questions about the alumnus’ current career, industry, and the path they took to get where they are today. We – the alumni – were invited to share advice we have for students interested in pursuing a career in our field. We were also encouraged to bring information about our organization and any other information that might be helpful for students thinking about a career in our industry. Firstly, I was delighted to be asked to participate. Being that I work in alumni relations, and organize events somewhat like this one, it’s always fun to be on the other side of the event. Secondly, I was so grateful that – especially at a business-focused school like Laurier – the organizers were making an effort to include careers like fundraising, something that isn’t likely to spring into a 4th year student’s head when they’re thinking of what they’ll do after they graduate. Thirdly, I was excited to have the chance to share the joys of my field with soon-to-be university graduates!!! When I go to events like this, or networking events in general, my mission is simple: truly connect with a few people. I’m not a mingle and small talk kind of girl; I would much rather invest in deep and meaningful conversation with 2-3 people than leave with 15 business cards of faces I can’t recall. So at Career Connections, I didn’t pressure myself to have a line-up at my table, just a few students who I could have some good conversations with. Thankfully, that’s what I’ve got. I had three students come to my table and really stop to learn about what it is I do. When asked by a student what I love most about my job, I said that every day is different; one day I could be out in Halifax hosting an alumni event, the next day I could be quietly working on a young alumni solicitation letter, and the next I could be calling a major gift prospect. One student said that he was interested in education, but not in being a teacher. I said educational fundraising is an amazing way to be involved in education if it’s something you’re passionate about; you might not be on the front lines teaching kids, but you’re actively working to raise funds so that the teachers can do what they do with the best resources available. On the same vein as every day being different, I spoke to another student about how fundraising engages so many different “muscles” in you; there’s lots of opportunities to build and enhance interpersonal skills, many times I find myself using the critical thinking skills I learned in university to analyze fundraising communications materials, and when it comes to making the ask, it’s a great challenge every time! You have to think hard to align the needs of the institution/organization with the passions and interests of the prospect. It’s tough work, but rewarding, and fun!!! Career Connections was a great experience, and I hope to have more opportunities in the future to share with others the joys of the field I love: fundraising. Where can I find passionate fundraisers??? However, thankfully the delight of connecting with like-minded individuals and equally passionate fundraisers has not worn off… especially when I’m exposed to something new, fresh, and very focused, like Young Non-Profit Professionals (YNP). You may remember me mentioning YNP (#YNPcanada) before in a guest post in April of this year: “Is storytelling really the answer for your charity?? ?”, written by one of YNP’s founders, Brock Warner. I heard about YNP through my sister, who encouraged me to attend their 1-year anniversary event back in March. I went, met some great people, and was wildly inspired and energized by a speech by Paul Nazareth, Philanthropic Advisor (a.k.a. coolest job ever). Needless to say it was a successful event as far as my experience was concerned. The reason I was inspired to write about YNP now is because I attended another one of their events this past Tuesday, July 24th, held on the rooftop of The Spoke Club in Toronto. Once again YNP did not disappoint with a great venue, fantastic networking opportunities, and an incredible speaker – Daniel Bida of ZooShare (more on that fantastic organization later, perhaps). 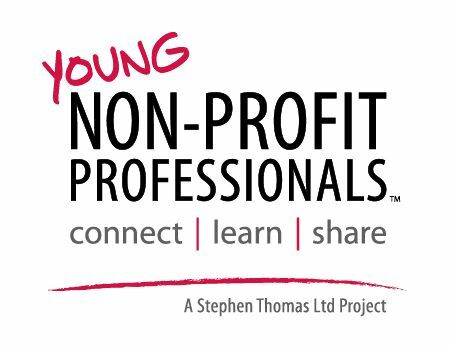 YNP is great because it’s so specific – young, non-profit professionals. When you’re networking at a YNP event, you’re meeting people close to the same age and stage as you, facing similar obstacles in their career path, or celebrating similar achievements. 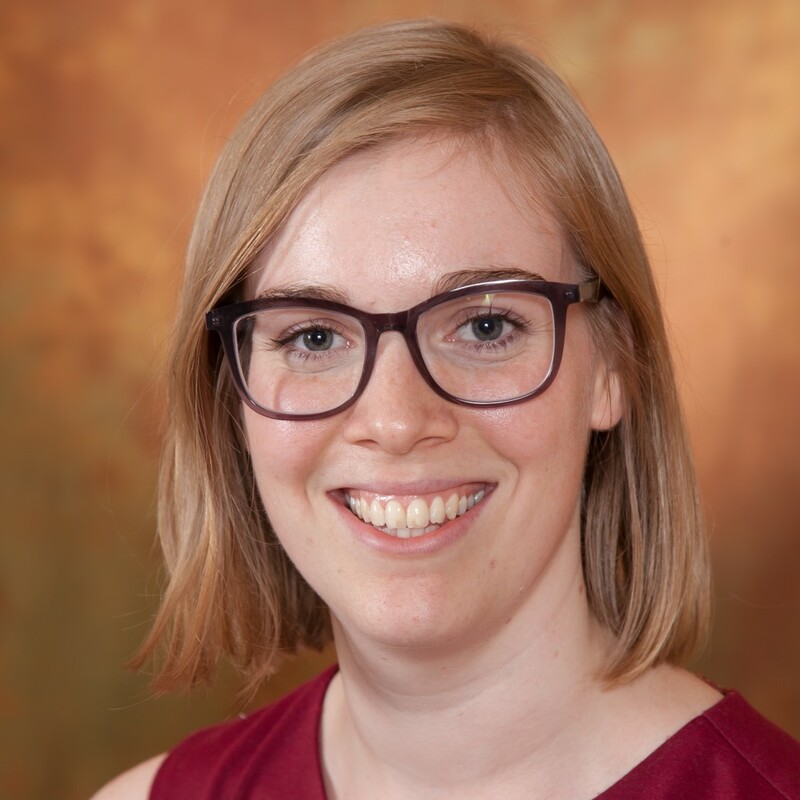 However, YNP is also great because it’s not just about educational fundraising, or even fundraising; it’s about professionals working in the non-profit sector, which casts the net fairly wide. That means that you’re meeting people in all sorts of orgs with all sorts of positions, so it can be equal parts validating and inspiring; a great balance to have at a networking event. The point is that there’s something out there for everyone. You may think that you’re uniquely nerdy and passionate about a topic, but then you’re exposed to something like YNP, and you realize you’re not alone after all. Passion is everwhere! What’s your favourite professional organization??? (Be as specific as you’d like).